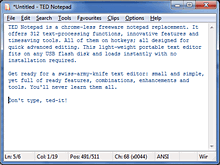 [En] TED Notepad is a chrome-less freeware notepad replacement. It offers 312 text-processing functions, innovative features and timesaving tools. All of them on hotkeys; all designed for quick advanced editing. This light-weight portable text editor fits on any USB flash disk and loads instantly with no installation required. [It] Decomprimere l'archivio.zip ed avviare l'applicazione eseguendo TedNPad.exe. [En] Extract the ZIP package to any folder of your choice, launch the program by double-clicking TedNPad.exe.